A somewhat crude laboratory test used to screen maternal blood samples for the presence of fetal red blood cells. The “K-B” test, as it is known, takes advantage of the fact that baby RBCs are generally rich in hemoglobin F, and hemoglobin F is resistant to acid. A blood sample from the mother is made into a smear on a glass slide, then the slide is flooded with acid. Maternal hemoglobin (presumably hemoglobin A as in most adults) dissolves away and the fetal hemoglobin F remains intact. Then, the slide is washed, stained, and read. 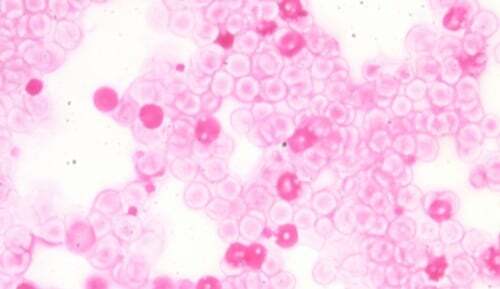 The fetal RBCs appear bright red, while the maternal RBCs are pale because they have lost their hemoglobin (see the image below). The technologist counts 2000 cells, and the percentage of fetal cells is used to predict the percentage of fetal red blood cells in the maternal circulation. This value is then used to calculate the total amount of fetal blood in the mother’s circulation, so that D-negative mothers may receive appropriate amounts of prophylactic Rh Immune globulin. The K-B test may be challenging to interpret, and is subjective, but it is low-tech and most hospital laboratories use it.